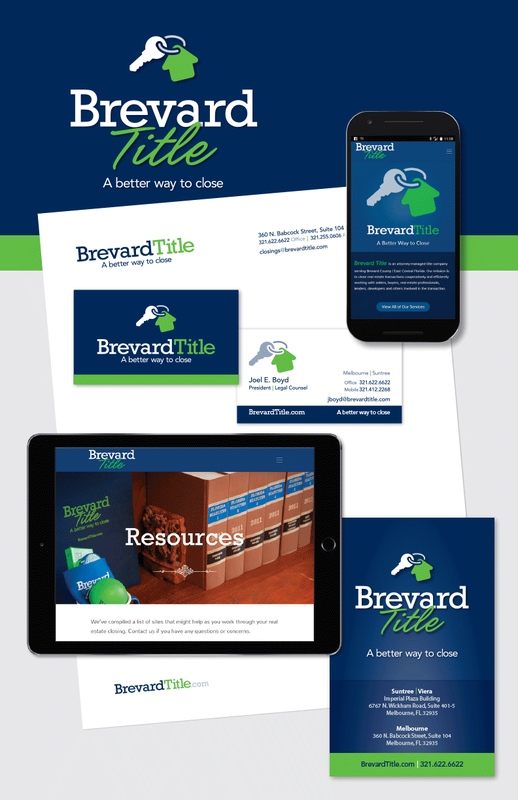 Artemis, the Space Coast’s premier internet services firm, was recognized for their Internet development, responsive design, and an Integrated Identity Campaign for client, Brevard Title. 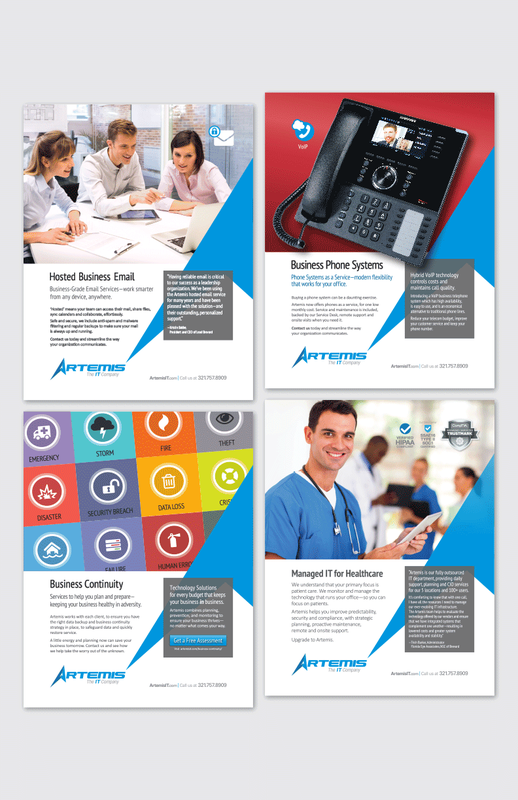 Their marketing and development teams earned Addy awards for their own campaigns, Artemis business continuity and internet marketing material. The American Advertising Awards recognizes the best in advertising. A three tiered competition, over 40,000 entries vie for awards at the local, regional and national level. Our local club is AAF-Space Coast and Eric Needle, Longbow founder, has served as President this year. We belong to the 4th District, which includes the State of Florida and the Caribbean. This year’s awards were presented at the American Advertising Federation’s ceremony on February 27 at the Courtyard by Marriott in Cocoa Beach, Florida. ADDY-CON celebrated the comic book world with MC Stephanie Herndon as B-ADDY girl. 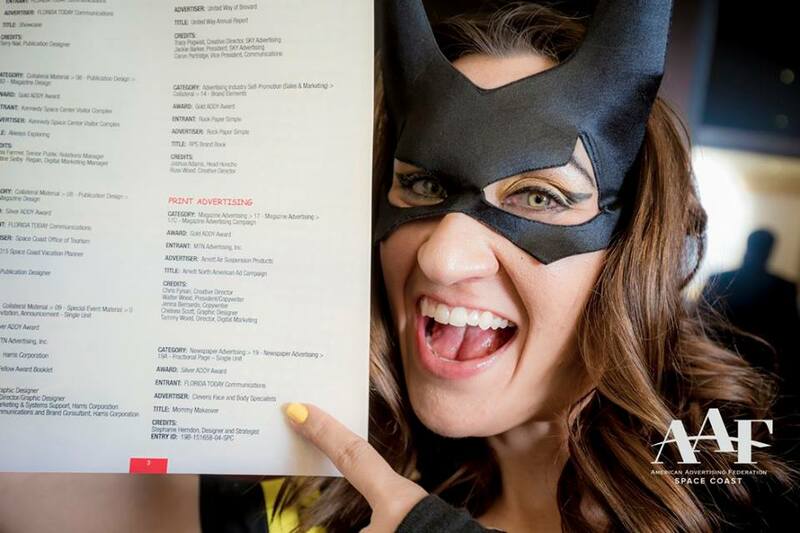 Stephanie was hilarious and energized, and joined by a crew of costumed guests including Batman, Superman and Wonder Woman. Captain America was present, though Marvel was under-represented this year. In 2015, local attorney Joel Boyd launched title company, Brevard Title. The Marketing team at Artemis, led by Longbow founder, Eric Needle, designed the Brevard Title brand and a series of ads that ran in area publications. This work won a Silver Addy as an identity campaign, with stationary, collateral and promotional items. The team took home Addys for both Brevard Title’s website and its use of responsive design. Ole Goode, Artemis designer, and Eric developed custom content and great photography for the site, capturing the essence of Brevard Title in their logo, our website, and print work. 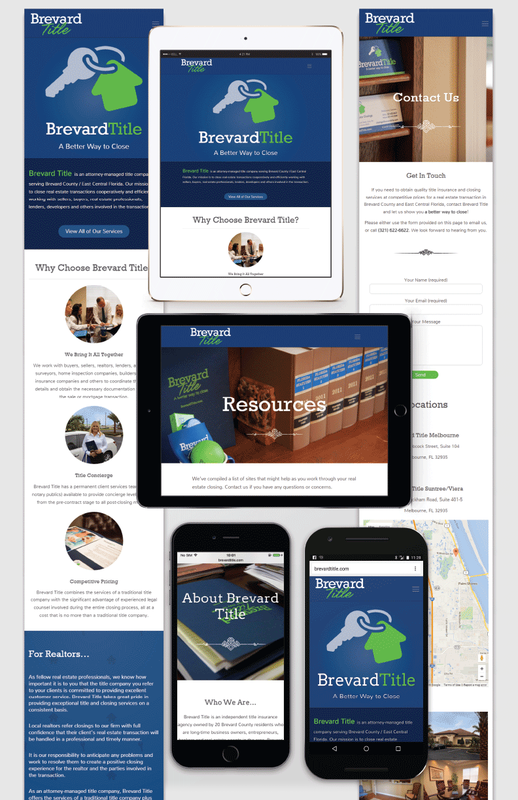 For their advertising, the focus was on brand recognition and distinguishing Brevard Title as an attorney powered mortgage company, a huge advantage for the firm. Three Addy Awards as you launch a new venture helps spread the word about a company focused on quality, appealing to a discerning client base. Artemis also earned two additional awards for their integrated campaigns. 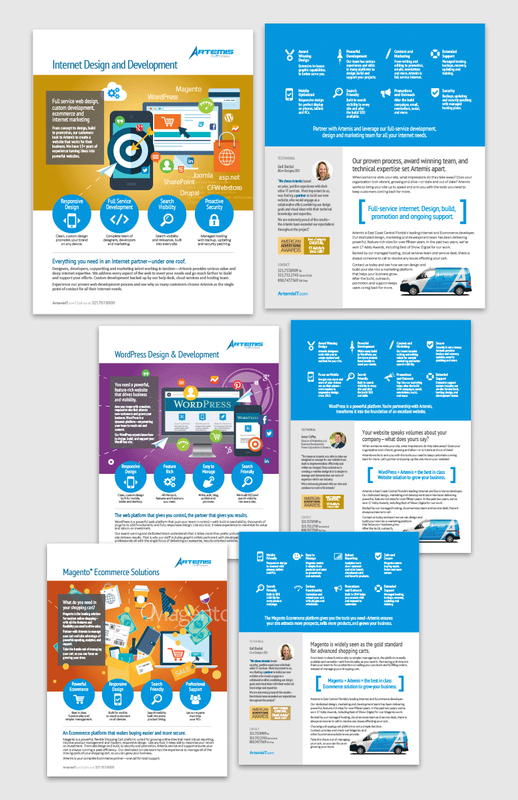 For the past three years, the strategy at Artemis was to show our expertise in web and responsive design, and promote the company by highlighting it’s advertising campaigns, testimonials, and branding. 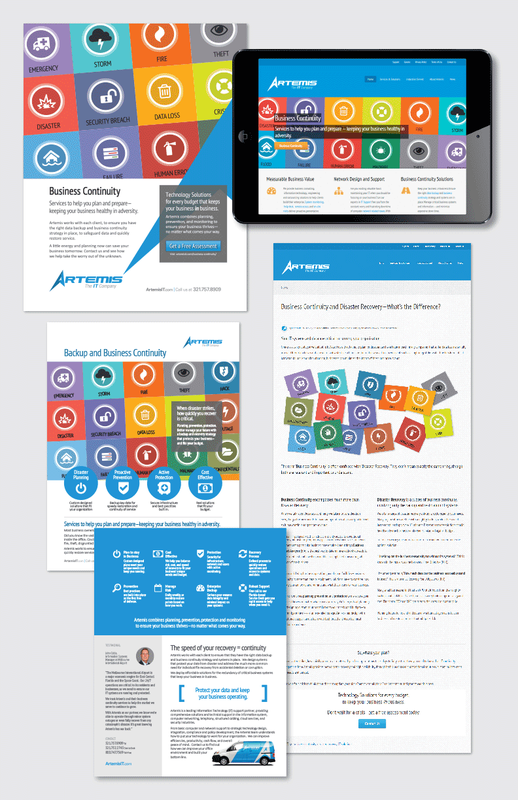 To promote their Business Continuity service line, Eric created a one page sell sheet, full page ad, custom graphics and articles they used in social media and newsletters. And for Internet services, they created a sales kit, highlighting the team’s expertise in WordPress, Magento, and broader offerings. 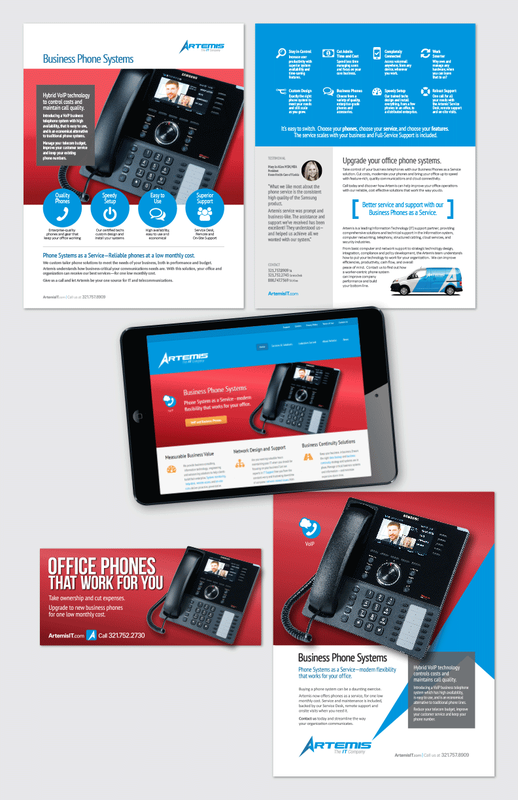 Above is a collection of full page magazine ads, our service line campaign. 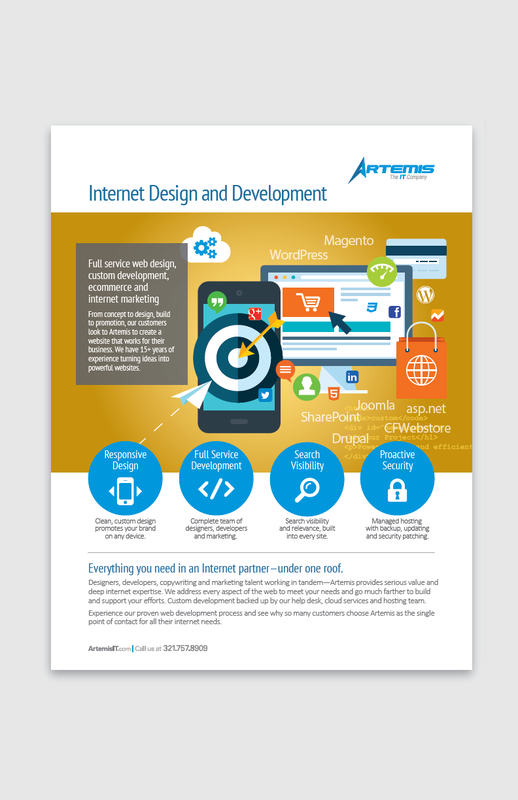 And below our Internet Services one pagers as well as a closeup of the Internet Design And Development sell sheet. Eric served Artemis as Marketing Director for three and a half years and continues to be a resource via Longbow. In fact, we’ve run Longbow out of their offices since 2001. Over the past three years, we’ve won 22 Addy Awards, Best of Show Digital and a District Silver Addy. We’d love to create award-winning work for you. Contact us for an initial consult. 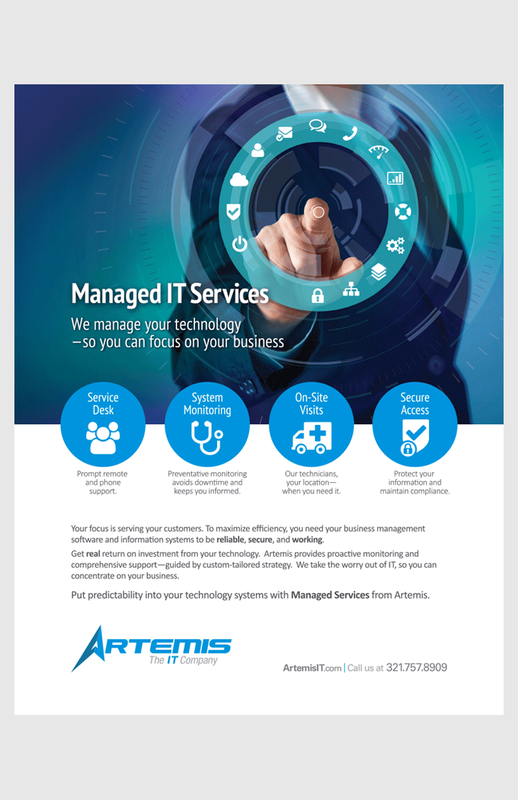 For more information, visit Artemis. Discover more about the Addy Awards at AAF Space Coast.